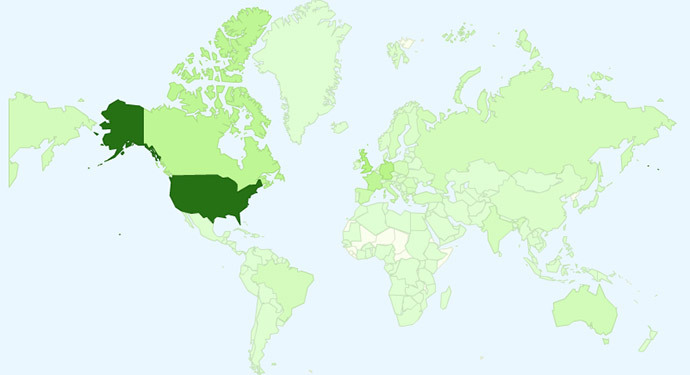 In the image above you can see which countries have the highest interest in 3D (just the top 10), based of course on the visitors on the Blog. United States is number 1 as expected, with close to 1/3 of the total visitors coming from there, followed by United Kingdom, Germany, Canada, France, Spain, Italy, Russia, Brazil and Australia. But as I already said, there are visitors coming here from all over the world that are interested in 3D and that interest is constantly growing, a trend that is easy to notice when looking at the traffic graph over time. And this increase in interest is not only coming from the users side, but also from the people in the industry that tend to organize more and more 3D-related events, present new 3D solution and of course work more actively on developing stereo 3D content. 1. What to Choose: IMAX 3D versus RealD versus Dolby 3D for 3D Movies? 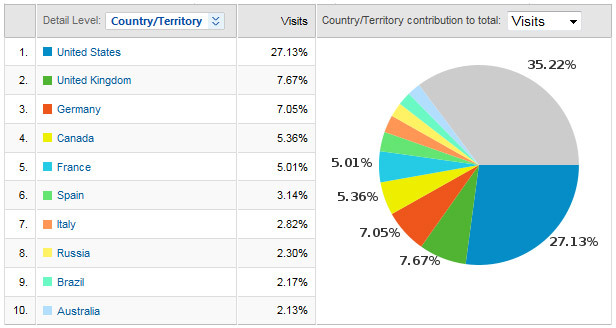 Cool, Germany is 3. :D.
You have a nice number of visitors ;). Hmm I don’t think that many people block Google Analytics :D.
Great 3D site, only good stuffs and most recent news about 3D. I´m really satisfied keeping 3D Vision focus, helping consolidate and expanding this technology, pushing users to get same model. From Brazil … tks! greets from vienna / austria! So this guy here are have good news and now about newest drivers for nvidia 3d. So im stay tuned to get much more input. Trailers are great, too! So i love this site. Go up with this good work!